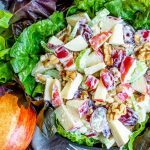 A Simple Pear and Almond Appetizer for a Wine Tasting Party - Home. Made. Interest. 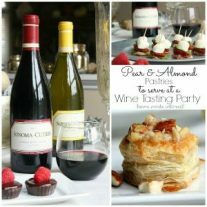 We hosted our first Wine Tasting Party and we have some amazing wines and a delicious recipe for Pear and Almond Pastries for you to pair with them! Well, it was bound to happen, Melinda and I are really grown-ups. That’s how I felt this weekend when we got together to host our first wine tasting party. 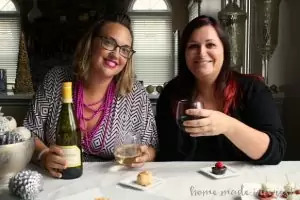 Neither of us were big wine drinkers in our 20s but as we’ve gotten older our taste has improved and in the last year or so we have really gotten into tasting different wines to figure out what we like, and sometimes what we don’t. It’s always changing too. We both agree the more we try the more our appreciation of a good wine seems to grow. Don’t get me wrong, we’re still total newbs when it comes to wine tasting! We can’t take a single sip and tell you all about a wine and list off the flavors in it, BUT practice makes perfect! We recently received a couple of bottles of wine from Sonoma-Cutrer and, since the holiday party season is here, we took that as a sign it was time to take our wine appreciation to a new level. 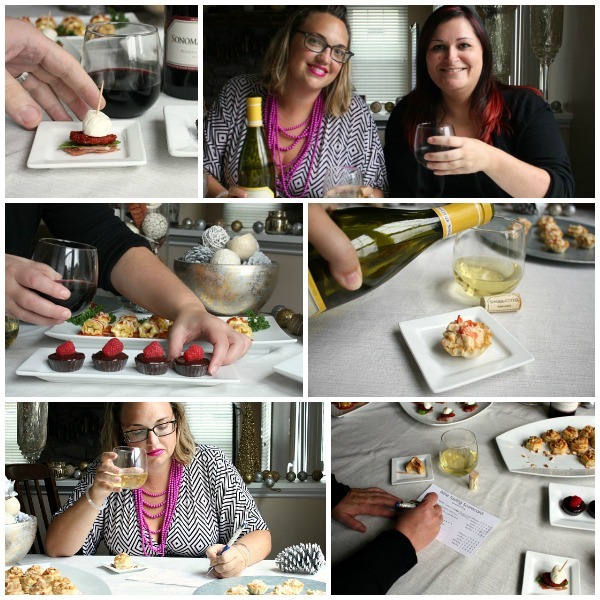 We hosted a small wine tasting party with friends with varying levels of wine experience and, because you know we love to try new recipes, we made bite size appetizers, one savory and one sweet, to pair with each wine. 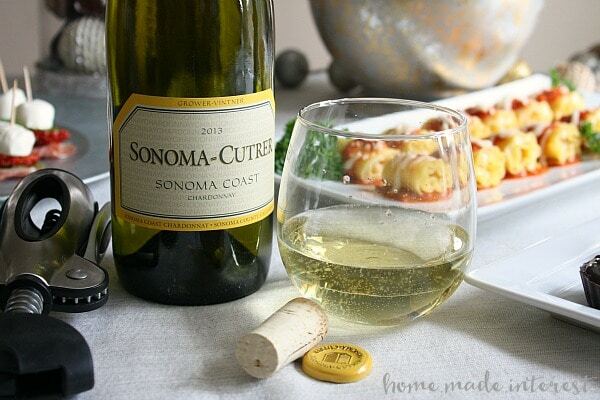 Sonoma-Cutrer is a winery located in California that is known for their Chardonnays so one of the first wines we tried was their 2013 Sonoma Coast Chardonnay. I’m a white wine girl so I was all about this Chardonnay. The first thing I have to say is it smells delicious! It has a fruity aroma, and after consulting the tasting notes (I told you guys I’m new at this!) I identified them as Golden Delicious apple, Bosc pear and white peach. The fruity aroma is accented with with oak spice, a hint of vanilla, toasted almonds, a light floral note and a touch of butterscotch. Sounds amazing right? Our savory pairing was our baked crab bites, but the real star was our Pear & Almond Pastries. We took flavors from the wine, pears and toasted almonds, and combined them together with Havarti cheese in a bite size puff pastry (see recipe below). 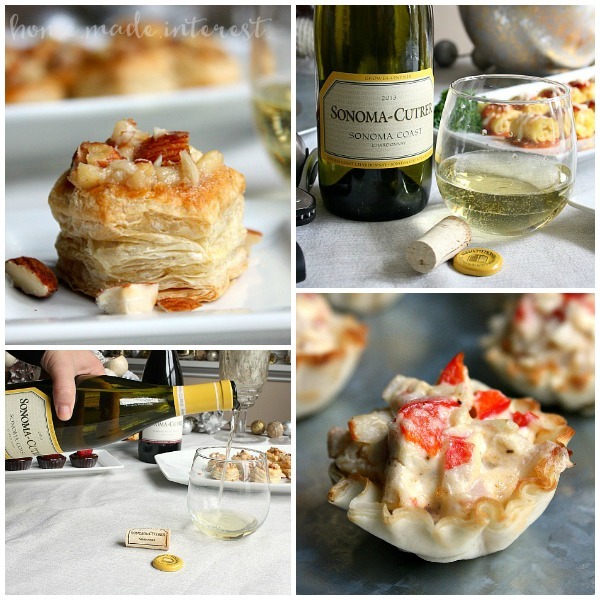 Guys, if you are having a holiday party this year your guests are going to love this…along with a bottle or two of 2013 Sonoma Coast Chardonnay! Sonoma-Cutrer may be associated with Chardonnays but their Pinot Noir is one of the best-kept secrets in California wine. This one was Melinda’s favorite. She loves a good red wine and the 2013 Russian River Valley Pinot Noir has a rich, deep aroma of dark fruit like blackberry, dark raspberry, and black cherries, followed by an earthy, forest floor complexity and accented with hints of cola, tobacco, licorice, and baking spices. When you take a sip you can taste hints of cherry, strawberry, barrel spice, and dark chocolate. 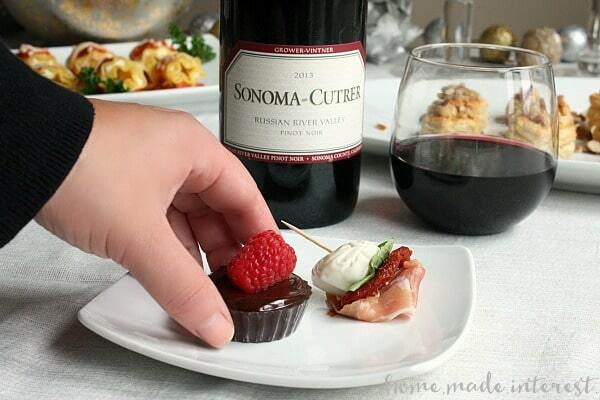 We paired it with a simple antipasto skewer and dark chocolate ganache cups topped with a dark chocolate glaze and a fresh raspberry. Both dishes had full, rich flavors that paired well with the wine, especially the dark chocolate ganache cups. The dark chocolate and raspberry really brought out the flavors in the wine. Not to mention they were super easy to make (recipe coming soon!!). Before the party we made some simple wine tasting cards for guests to use as they tasted the wines. I actually really enjoyed talking to friends about the wines and learning a little more about how to describe the flavors I was tasting. I know you’re totally psyched to host your own wine tasting party now (or just buy a few bottles of Russian River Valley Pinot Noir and Sonoma Coast Chardonnay for yourself). Don’t forget it, if your friends are anything like ours, these wines also make a great gift during the holidays. 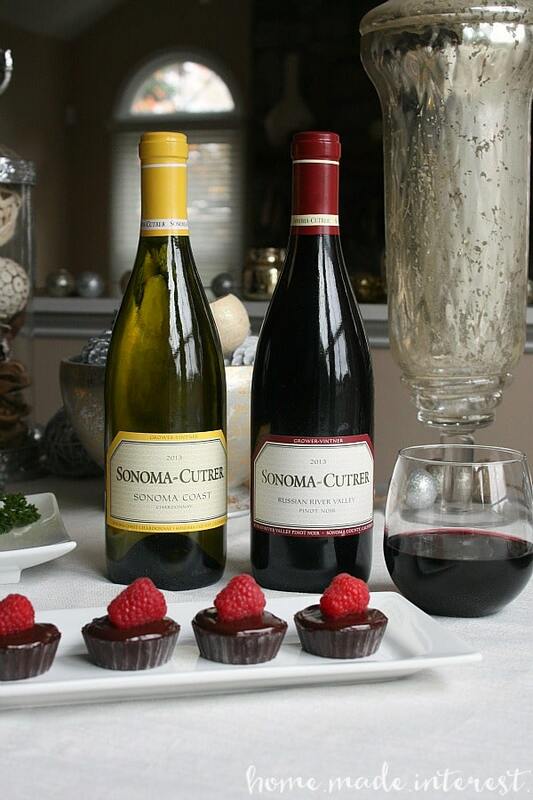 You can shop online for Sonoma-Cutrer wines and it make life so easy, just place your orders and let the gift-giving begin! 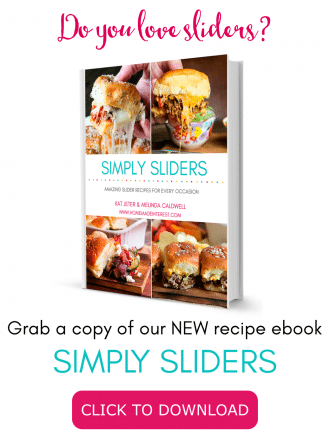 And now for that recipe you’ve been waiting for! Add sugar to the pan and keep stirring until it becomes a brown caramel sauce, 2-3 minutes. Remove from heat and add lemon juice, pear, almonds. and Havarti cheese. Spoon the mixture into cooked puff pastry cups. 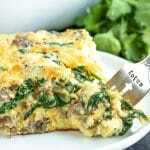 Serve with a glass of Sonoma Coast Chardonnay! This looks so good! 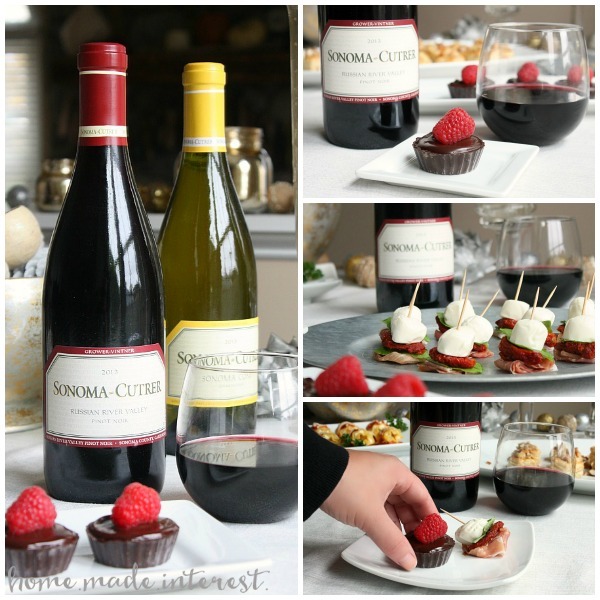 I need some more Wine in my life….and I LOVE Sonoma Chardonnay! We made the pear and almond appetizer for our annual Christmas party at our home. 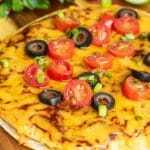 The flavors blended well, however, the appetizer needed a big more flavor in my opinion. Could have been the pears we chose, etc. Any ideas what spices could be used with this to zip up the flavor? Rosemary, etc? We also made the brownie bites – using store-bought brownies from Costco, ganash and a raspberry. Delicious and simple. 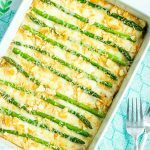 Thanks for your recipes and wine pairing ideas. You could try adding a little cinnamon and anise (just a pinch of each will do they are really strong flavors). You could also try adding some vanilla extract. Rosemary or thyme could be interesting too. If you try it let me know what you think! Can I make the cups ahead of time, or do they need to be warm when the mixture is poured over them? You can definitely make the cups ahead of time. They are fine served at room temp.